Wow! Just came home from a concert in St Pete and as if I thought the night couldn’t already get better. Great news to see! Glad he decided that Tampa was the place to be. So I wonder what happens with the guards when does Sweezy get the ax? Does it make more sense to keep him on as a back up or try him at the Left Guard spot. That's the biggest question right now. Rather than move Sweezy to LG last year and start Hawley/E Smith at center, we moved Marpet to center and had a convoy at LG. I think our "best five" would be something like D Smith-Sweezy-Jensen-Marpet-Dotson. But we might just plug Jensen in at LG and leave Marpet and Sweezy where they were last year. I'd guess we'll roll with D Smith-Jensen-Marpet-Sweezy-Dotson. For better or worse. The draft could change this. He's a guy I definitely want if we can't get Nelson. But he might go late in the first. I think Price's injury might bump him to the second round, which would bump Hernandez up. 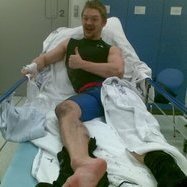 Ragnow is a guy we might be able to take in the third. Either way, I agree and hope we draft someone to compete with Sweezy. This contract was a little more than I would have liked as a ravens fan, which is mostly due to our constrained cap. Jensen came out of the smallest college, like Rancho El Pueblo-something, and needed some time to catch on. Once he finally came together this season (apparently surgery to help with his sleep apnea helped), he was the key fixture on an offensive line that struggled do to injuries. He held up in pass pro, got push in the running game and showed a nasty streak. He hasn't much wear and tear on him, so he could be a really good signing with him hitting his prime. I think Sweezy gets cut now. Since he cant play center, I dont they want a potential backup making 4 million who can only play guard. Liedtke is on the roster right now, who can play center. I think Licht will sign a cheaper vet to add depth then Sweezy. I think the Bucs will do a wait and see approach. I don’t think it matters when we cut Sweezy. So we will probably hold on to him until at least after the draft. It doesn't look like we're locked into Sweezy for any more guaranteed money. He played 83% of the snaps last year, which got him his escalater in his contract. But I don't think we owe him anything guaranteed. Hope his attitude rubs off on Donovan and Ali. Really applaud Licht for getting the deal done. I remember watching the Dolphins Ravens game when Alonso laid the dirty hit on Flacco and I wanna say it was Jensen to go after Kiko Alsonso right away before because mauled by a pile of Dolphin players. Good job on the contract, I just think they may be more inclined to spend 2 million or less on an Evan Smith type player and draft a LG or hope Benenoch wins the job. 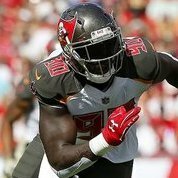 The path is there for Benenoch, Pamphile started the same way on the depth chart. Agree with others, I doubt Sweezy gets cut now. Penn used to be that guy for us.